Perennial. Culms decumbent; 20-100 cm long; rooting from lower nodes. Culm-internodes channelled. Culm-nodes glabrous, or bearded. Leaf-sheaths loose (DIVERGENT FROM INTERNODES). Ligule a fringe of hairs, or absent. Leaf-blade base broadly rounded. 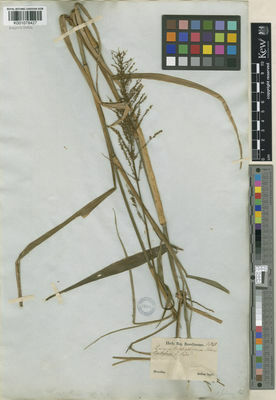 Leaf-blades linear, or lanceolate; 4-30 cm long; 7-30 mm wide. Leaf-blade surface pubescent, or pilose. Leaf-blade apex acute, or acuminate. Inflorescence composed of racemes. Racemes 10-20; borne along a central axis; spreading; unilateral; 1-3(-5) cm long. Central inflorescence axis 5-20 cm long. Rhachis angular; ciliate on margins. Spikelet packing crowded. Spikelets in pairs, or in threes. Fertile spikelets pedicelled; 2-3 in the cluster. Pedicels unequal. Spikelets comprising 1 basal sterile florets; 1 fertile florets; without rhachilla extension. Spikelets ovate; dorsally compressed; acute; 1-1.5 mm long; falling entire. Glumes dissimilar; reaching apex of florets; thinner than fertile lemma. Lower glume ovate; 0.33-0.5 length of spikelet; membranous; 1-keeled; 1-3 -veined. Lower glume apex acute. Upper glume ovate; 1 length of spikelet; membranous; 1-keeled; 5 -veined. Upper glume apex acute. Basal sterile florets barren; with palea. Lemma of lower sterile floret similar to upper glume; ovate; 1 length of spikelet; membranous; 3-5 -veined; acute. Fertile lemma oblong; dorsally compressed; 1-1.5 mm long; indurate; pallid; shiny; without keel. Lemma margins involute. Lemma apex obtuse. Palea involute; indurate. North America: Mexico. South America: Mesoamericana, Caribbean, northern South America, western South America, Brazil, and southern South America. Nativa en Colombia; Alt. 0 - 1500 m.; Amazonia, Andes, Guayana y Serranía de La Macarena, Islas Caribeñas, Llanura del Caribe, Orinoquia, Pacífico, Sierra Nevada de Santa Marta, Valle del Cauca, Valle del Magdalena. Belize, Bolivia, Brazil North, Brazil Northeast, Brazil South, Brazil Southeast, Brazil West-Central, Colombia, Costa Rica, Cuba, Dominican Republic, Ecuador, El Salvador, French Guiana, Guatemala, Guyana, Haiti, Honduras, Jamaica, Leeward Is., Mexico Central, Mexico Gulf, Mexico Northeast, Mexico Southeast, Mexico Southwest, Nicaragua, Panamá, Peru, Suriname, Trinidad-Tobago, Venezuela, Windward Is. Panicum apiculatum Salzm. ex Steud. 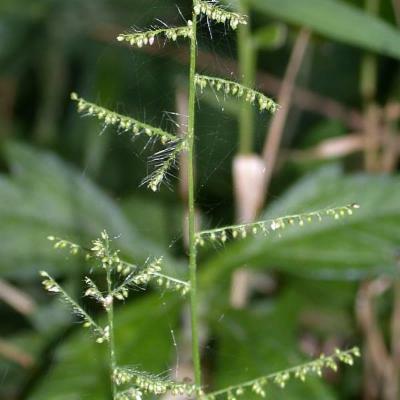 Panicum densiflorum Willd. ex Spreng. 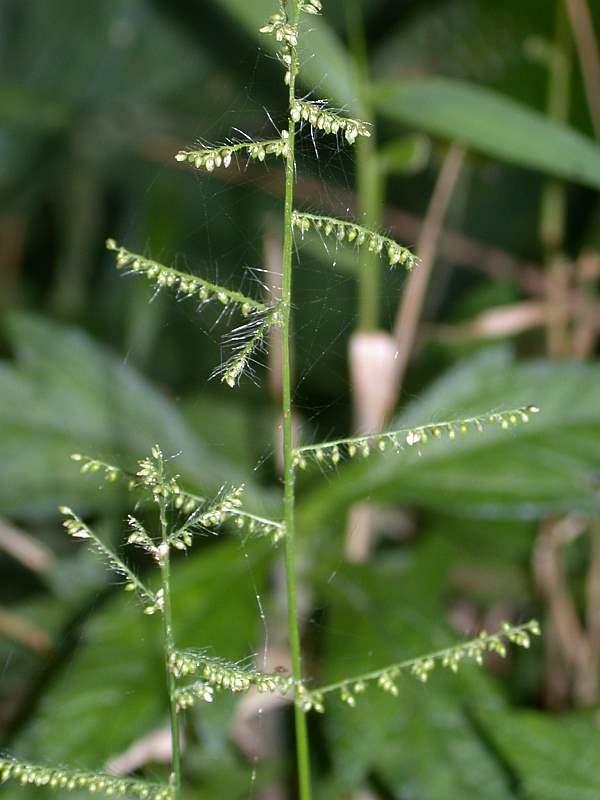 Panicum distans Willd. ex Spreng. 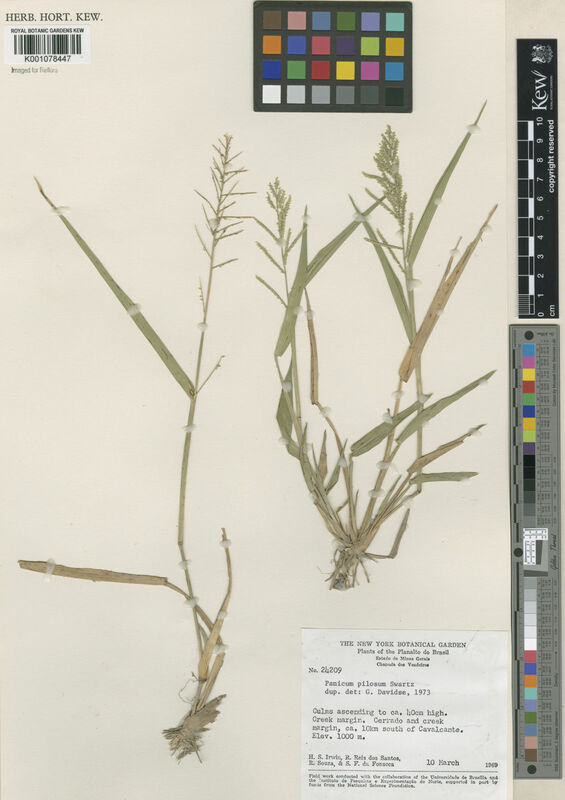 Panicum distichum var. luxurians G.Mey. 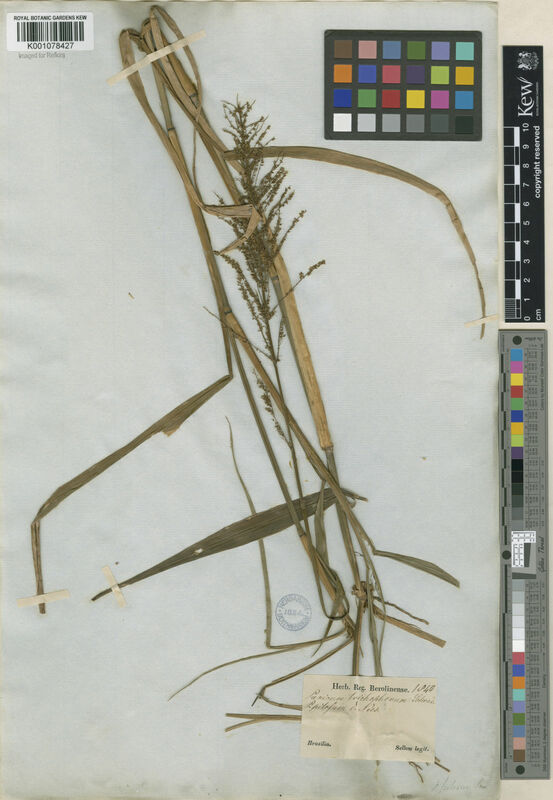 Panicum monobotrys Trin. ex Steud. Setaria pennisetum Roem. & Schult.